Who are the Mount Rushmore Presidents? Where is the Mount Rushmore National Memorial? Who sculpted the heads of the Mount Rushmore Presidents? This article provides interesting facts and information about the history surrounding the creation of the Mount Rushmore National Memorial and the lives of the Mount Rushmore Presidents. The Four colossal heads of the Mount Rushmore Presidents are granite sculptures of President George Washington, President Thomas Jefferson, President Abraham Lincoln, and President Theodore Roosevelt. These four famous US Presidents were sculpted by Gutzon Borglum on the face of a granite mountain in the Black Hills National Forest. The massive sculptured heads of the Mount Rushmore Presidents grace the Mount Rushmore National Memorial (see the Mount Rushmore Presidents picture below). Fact 1: The sculpted heads of the Mount Rushmore Presidents from left to right are George Washington, Thomas Jefferson, Theodore Roosevelt and Abraham Lincoln. Fact 2: The Mount Rushmore National Memorial is carved into a granite mountain in the Black Hills National Forest, South Dakota. Fact 3: The granite mountain is 5,725 ft (1,745 m) high. 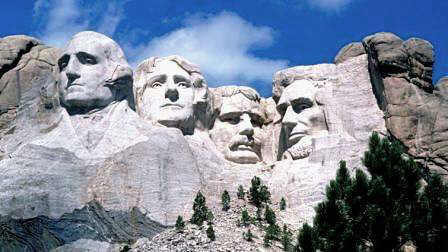 Fact 4: The heads of the Mount Rushmore Presidents are each about 60 ft (18 m) high. Fact 5: In 1924 Doane Robinson, known as the "Father of Mount Rushmore" was inspired by the mountain to create an awesome attraction in his home state of South Dakota. Fact 6: Doane Robinson contacted the sculptor Gutzon Borglum to create the magnificent monument. Fact 8: The monument was deemed complete and ready for dedication on October 31, 1941. Mount Rushmore Presidents: Why was President George Washington chosen? Mount Rushmore Presidents: George Washington was an obvious choice as one of the Mount Rushmore Presidents as the 1st President of the United States of America. George Washington helped to establish the new federal government of the United States and aspired to create a free, democratic and united country. The face of George Washington was the first one completed by Gutzon Borglum and his crew on Mount Rushmore in 1930. 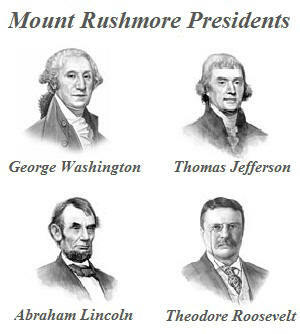 Mount Rushmore Presidents: Why was President Thomas Jefferson chosen? Mount Rushmore Presidents: Thomas Jefferson, the 3rd US President, was chosen as one of the Mount Rushmore Presidents because of his work as the author of the Declaration of Independence and for his negotiation of the Louisiana Purchase with France which effectively doubled the size of the United States. He was greatly admired for his great intelligence, vision and statesmanship. Mount Rushmore Presidents: Why was President Abraham Lincoln chosen? Mount Rushmore Presidents: Abraham Lincoln, the 16th US President, was chosen as one of the Mount Rushmore Presidents because he was a personal hero of Gutzon Borglum, who had even named his son Lincoln in honor of the President. President Lincoln was admired for his honesty, integrity and determination. Mount Rushmore Presidents: Why was President Theodore chosen? Mount Rushmore Presidents: Theodore Roosevelt, the 26th US President, was chosen as one of the Mount Rushmore Presidents because he was a personal friend of the sculptor who admired Roosevelt for his enthusiasm, his quality of persistence, his assertiveness and his vitality. Although not an immediately obvious choice, Theodore Roosevelt had established the National Forest Service and had worked tirelessly to on the National Monuments Act of 1906 that was aimed at the Preservation of American Antiquities and to establish National Monuments. The Mount Rushmore Presidents provided the inspiration for Doane Robinson and Gutzon Borglum to create the Mount Rushmore National Memorial. The following US Presidents video enables you to sit back and listen to the history of the personal and political lives of all the US Presidents - a useful educational resource for kids, children and schools learning about the Mount Rushmore Presidents and all the other Presidents of the United States of America. More facts and information.